Trumpets blare and drums beat. 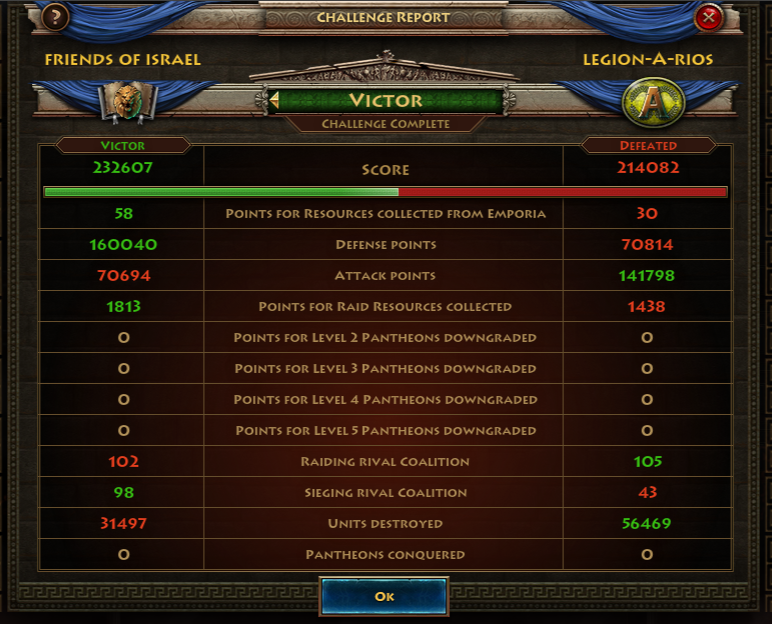 A challenge is initiated between the Legion and the Friends of Israel. Both sides are equally matched and the champions are yet to be determined. Trumpets blaring, drums beating, flags flying high in the wind. Great lords and noble champions alike rode out onto the field to test their mettle and skills against one another. A challenge is born and to the victor goes the fame and glory! The two opposing sides are the Legion-A-Rios and the Friends of Israel, equally fearsome foes possessing capable champions on both sides. Who will win, who will lose? This challenge, as many others do, started out with a dispute between members, that rapidly escalated into the ranks of the leadership. Rather than enter into a never-ending war, it was decided that a seven day challenge would best decide a victor. Starting off the event, both sides landed a number of minor and more serious blows on one another, neither was able to pull ahead in a serious way and still, even halfway through the event, it was unclear who would be the victor. It was simply too close to call. 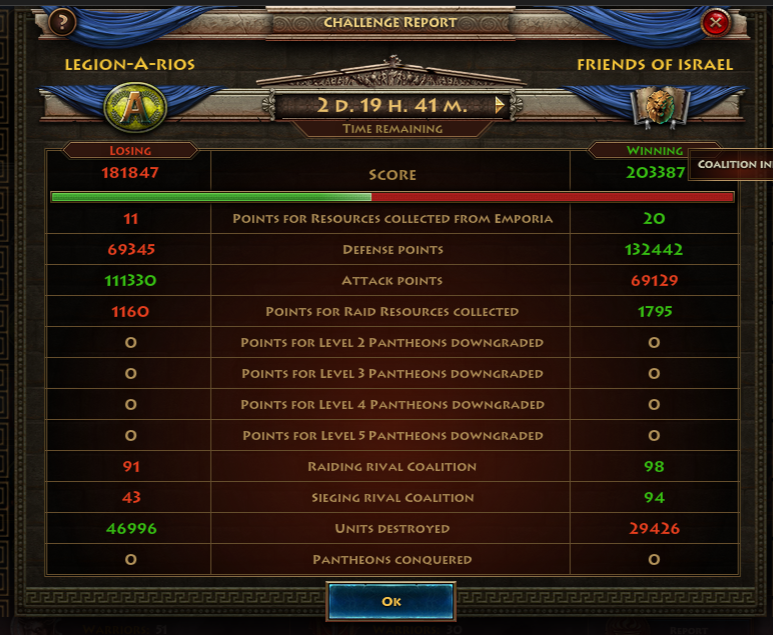 As can be seen from the above report, with almost three days remaining, both sides were close in the scoring. The Friends of Israel were clearly winning in regards to defensive points, as they successfully stopped a number of attacks from their opposition. 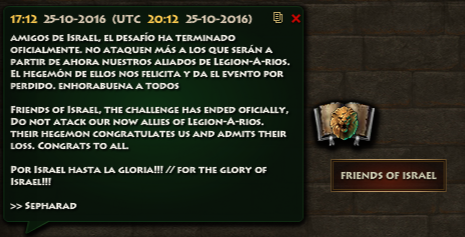 Meanwhile, the Legion-A-Rios was ahead in attack points, proving that they were more willing to take the battle to their foes lands, even if that may of proven to not be the best strategy in the end. With the challenge coming to a close, the results were still incredibly close and the judges were forced to tally up the numbers. Great lords awaiting anxiously for the results to be officially announced. Finally, to much cheering from the Friends of Israel, this close victory was awarded in their favor. As seen in the final results, they proved that they were able to rally together as a coalition and stop their enemies better than their foe was able to break through their ranks. Even though more units were destroyed by the Legion, the Friends of Israel simply proved to be more capable in rallying and combining their forces. A call was put out to cease all attacks. Many of these challenges end in only further bloodshed, as neither side is able to admit defeat. But in this case, the Chronicle can happily report that this story is the exception and both the Friends of Israel and the Legion were able to put aside their differences and more importantly their swords. An official alliance was entered between the two parties, ending their dispute and potentially making for a new alliance that can face future challenges and enemies together, rather than against each other.